Be aware that there will be a mixture of all kind of employers representing the sector exhibiting each day and you might find an employer that you had never really considered before becoming of real interest to you. 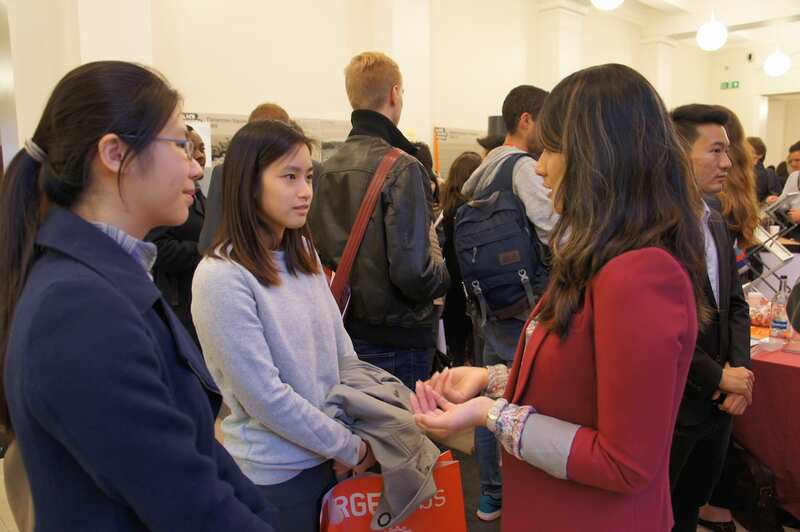 We strongly encourage you to do some research on the exhibitors before the fair at: ucl.ac.uk/careers/fairs where you’ll find a listing of exhibiting employers. As well as reading the exhibitor profiles, click through to the organisation’s own website to find out more about them. After your research, decide which exhibitors you particularly want to talk to in order to ask more informed questions. It can be difficult to understand the difference between big companies within the same sector. Often it’s the cultural aspects that make a real difference in the working environment and this can only be appreciated through talking and interacting with representatives at the Careers Fairs. Try to prepare some questions in advance and think about the main points that you would want an organisation to know about you – it can help you feel more confident. Each exhibiting organisation will have a stand and their representatives are there to answer your questions about the organisation itself, the nature of the job opportunities available to final year students and graduates, what internships/placements they provide to earlier year students, and any other opportunities available. Wherever possible, try to talk to someone on the stand instead of just picking up a brochure. Use the opportunity to ask your questions face-to-face. If you are feeling a bit nervous about approaching your first choice organisation, it can be a good idea to visit some other stands first to practice your technique. If you are given a business card, make a point soon afterwards of noting on it anything that it would be useful to remember. Have they suggested you email them with further questions? Did they give you advice on their recruitment process? Even if you have a ‘hit list’ of exhibitors, consider other organisations at the fair that are less well known. They might be offering just what you’re looking for. Avoid walking round the fair with a group of friends. The exhibitor may not realise that you’re interested in them, and you could miss out because your friend happens to be more talkative than you! If you feel overwhelmed, and don’t know what to do or where to start, make sure you visit the UCL Careers stand for help. Staff on the exhibitor stands can often be relatively recent graduates who can tell you what it’s really like to work in their organisation. They may even refer to particular projects that they’ve been involved in or training that they’ve had – all of which is great information for you to use when you apply for a position at their company. This insight is not available on any website and creates a unique impression when it is your time to apply. Finally, remember to bring your UCL ID card as you won’t be able to enter the fair without this! UCL Jobs Market 2016: save the date! The UCL Jobs Market 2016 is coming up on 8th June: a chance to meet employers with jobs, internships and training opportunities available with a Summer/Autumn start! No registration is required! If you wish to attend, simply turn up at any time while the event is running but be prepared to queue to get in as the event will be popular. As this event is only open to current UCL students and recent graduates, please remember to bring valid UCL ID with you as you won’t get in without it. For information about valid UCL ID, please visit www.ucl.ac.uk/careers/eligibility.